“Eid-ul-Adha”, is also commonly called by Arabs “Eid-ul-Kabeer “, the great Eid. It is celebrated by the Muslims on the 10th day of the month of “Zil-Hijjah” (the month of the pilgrimage) which is the 12th and last month of the islamic calendar. It marks also the celebration of the sacrifice of the prophet Ibraaheem (Abraham) (a.s). Thus the Muslims throughout the world, having the means, must achieve the sacrifice of an animal, this act is also called “Qurbaani”. 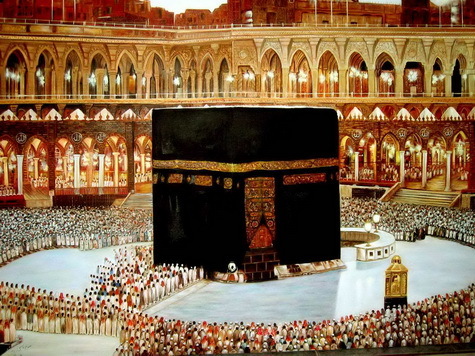 There are 2 rakaats of namaz waajib “Eid-ud-Duha” to achieve in jama’at at the mosque (masjid) on that day (except for the haajees who do not make this namaz because they are regarded as already plunged in the great ibaadat which is the hajj). On this festival day the fast is prohibited. By the way, we remind you that there are 5 days in the Islamic year on which fast (roza) is prohibited. They are: Eid-ul-Fitr (1st day of the month of Shawwaal), Eid-ul-Adha or Eid-ud-Duha (10th day of the month of Zil-Hijjah) and the 11th, 12th and 13th day of the month of Zil-Hijjah. The arabic word “iid” means contentment, joy and festivity. On that day, it is recommended to make a “ghusal” (great bath) specially for Eid-ul-Duha, to achieve the namaz Fajar in jama’at (for men), to eat an odd number of dates, to dress oneself with clean clothes (new if possible), to perfume oneself with attar (not-alcoholic perfume), to put surma (black eyes) before leaving for the mosque (for men) if possible on foot to achieve the namaz of Eid-ul-Adha in jama’at (congregation). Leave home with prior wazu (ablution). Change way upon return, i.e. return by a different way from that used when going to the masjid. Seize the opportunity to give alms (deen donation) and charity on this festival day by thinking of the poor and needy. Bear in mind that the holy prophet ( peace be upon him ) of Islam , always used to help the poor, orphans, destitues, all the time but especially on festival days. Make sure to attend all the program of the namaz Eid-ul-Duha being organized at the masjid (mosque), including the namaz-e-eid itself, the khutbah (sermon), tilaawat-ul-Qur’aan (reading of the holy Koran) and any other activities. Make duahs for the progress of the deen. Embrace your brothers (accolade) and let’s forgive each other fraternally. At home, spend good time in family, go pay visit to your close relations. Achieve the qurbaani. Eid-ul-Adha Mubaarak to all of you. Aameen. The word “qurbaani” comes from the arabic word “qurbiyyah” which means “Sacrifice” or “to sacrify oneself”. On its turn the word “qurbiyyah” is derived from the word “qareeb” which means “to approach” or “to become close”. Which means that any sacrifice made for the divine cause (of Allah ta’ala) has such an efect that it brings us closer to Allah ta’ala. One evening, the Prophet Hazrat Ibraaheem (a.s) received the order from Allah ta’ala to sacrify in the way of Allah, his son Ismaïl (a.s), whom he loved the most over all. Hazrat Ibraaheem (a.s) was a great prophet and patriarch. The dreams of the prophets are significants and not like ours. He was the close friend of Allah (khaleelullaah). He loved his creator Allah ta’ala more than anything else and was ready to offer his beloved son and whom he was given being very old. True sacrifices are those of which you sacrify the things which are most dear and affectionate to you, just as Allah ta’ala specifies in the holy Koran: “You can’t be generous enough, unless by sacrifying what you cherish most”. The prophet Ibraaheem (a.s) was not only ready to offer his son in sacrifice, but hoped also that his son himself accept to be sacrified in the path of Allah. Then he applied to his son telling him “O my son, I saw myself in dream, offering you in sacrifice to Allah ta’ala, what you do think about it?” and his son Ismaïl to reply: “Please just do according what you have been ordered to, insha-Allah, you will see me among those who have patience and fidelity”. Thus, prophet Ibraaheem (a.s) passed his knife on the throat of his son, it was in Mina, a place close to Makkah shareef (Mecca). Even the angels were astonished by this touching action of a father who was on the point of sacrifying his son, as an evidence of his faith and his obedience towards his creator. The angels started to celebrate praises to Allah ta’ala regarding the values of the father-son relationship. And Allah ta’ala wanted to show to the world that he in fact, tested the faith of Hazrat Ibraaheem (a.s) and his son and they both were victorious. On the moment that Hazrat Ibraaheem (a.s) was going to pass the knife on the throat of his son, Allah ta’ala sent the chief of his angels, Hazrat Jibraïl (angel Gabriel) (a.s) with a lamb, to cut its throat in the place of Hazrat Ismaïl (a.s), whom Allah had chosen to be the ancestor of the chief of all the prophets, Hazrat Muhammad Mustapha . Thus, Allah ta’ala ordered to his beloved Prophet Muhammad to establish to his people (ummah), for those having the means, to annually offer the sacrifice of an animal, in rememberance to the sacrifice of the Prophet Ibraaheem (a.s), commonly called the Qurbaani. It is waajib (compulsory) on any Muslim who is “swahibe-nisaab”, i.e. those on whom the annual zakaat applies, to offer one share of qurbaani every year at the time of Eid-ul-Adha. A “small” animal such as sheep, goat, lamb etc. includes one share and a “large” animal such as ox, bull, camel… includes seven (7) shares. The objective of Qurbaani is not only to celebrate the sacrifice of the prophet Ibraaheem (a.s), but also and inter alia, to feed the poor and destitute. The hadiths teach us that when the qurbaani is offered with sincerity, even before the blood of the animal touches the ground, Allah ta’ala makes qaboul (accepts) the act of the believer on behalf of his sincere intention (niyyat). The effect of this blessing is that Allah ta’ala moves away the person (and all his family) from misfortunes and calamities. The animal to be sacrificed must be of age, in good health, without any defect or disease, also without any wound. It must be correctly slaughtered according to the usual islamic rite i.e. the neck of the animal in direction of Qiblah and to pronounce the formula: “Bismillaah, Allaahu akbar” (In the name of Allah, Allah is great) at the time of cuting the throat. The person who will cut the throat of the animal must be in a state of ritual cleanliness (ghusal and wazu) as for all ibaadats. He will also have to read the niyyat before qurbaani. The qurbaani can be offered in the country where one resides or it can be made elsewhere (another country) provided that it is actually offered (but to make it with his own hands is of another barakat) and that the portion which is allocated to the poor goes really to poor.